Christmas is right around the corner, and just as any wise businessperson would do, we know you are planning to make the best out of the incoming holidays too! There are hoardings, banners, flyers, TV ads, Emails, social media campaigns, discount coupons, and whatnot everywhere! Offers are flying around every other store on the street making people go haywire (in a good way, of course). Moreover, if your promotions are on point during the holiday season, it evokes a delighting emotion in people and encourages them to buy. 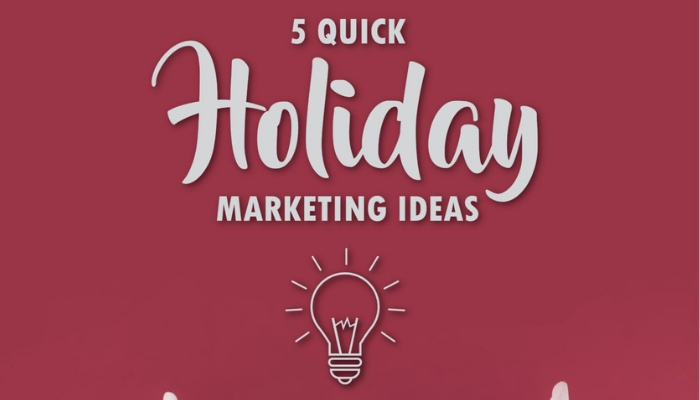 There are several ways you can nail your marketing holiday campaigns. Take a look at few of them below and use them to make the best of out holidays. It is the hard truth that most people don’t pay much attention to an ad at a first glance. However, if your promotion is creative and running repeatedly, it will eventually grow on the crowd. Promote often and through several channels for maximum influence. Holidays last a day or two, but your marketing campaigns shouldn’t. For better returns on your campaigns, start them way before holidays. For example, if you intend to promote your business during Christmas or New Year, start advertising in early November. And start planning for the same in mid-October. Holidays bring euphoria which pushes people to make rapid decisions. So, when they see there’s a worthy offer at your store, they are down to check it out! A limited-time offer emboldens people to act fast. A small time-extension on the current limited-time offer is much likely to yield added benefits. Well researched hashtags can take you places! You can use hashtags in copious ways. Either use them on your Instagram post campaigns our use to influence current trends on your Twitter posts, using hashtags has been proven to boost business immensely! A short social media marketing survey once returned a somewhat surprising result. It depicted that posts which had seven hashtags in their description on Instagram attracted more likes. You now know what to do! It is of paramount significance to highlight your USP in all of your marketing campaigns. If cost is not your strong point, highlight the quality of your products, exceptional user experience or customer satisfaction. One of the most effective ways to gain people’s trust is to show them what your customers got to say about you. Filming your customer’s honest feedback and posting it on social media can be a great way to gain trust. Online marketing may be the latest tool and all that, but offline marketing has its perks too! Many presume old-school marketing strategies outdated. However, you can do better! Incorporating print media in your strategies can be an effective way to raise awareness about your present or upcoming offers. Using flyers, banners, direct-mail postcards, discount coupons in newspapers, calendars, and much more in a potential expanse can be a great way to strengthen your marketing campaigns further. Try the above listed strategies and let us know how it works out for you! Got a unique strategy or idea to share of your own? We’re all ears!